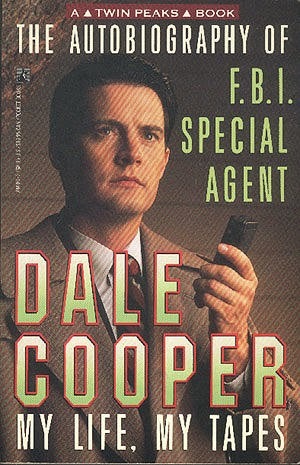 This tie-in book for my favorite show of all time purports to be a transcription of F.B.I. Agent Dale Cooper's tape recordings describing his activities from December 25, 1967-February 24, 1989, when he is sent to the small town of Twin Peaks, WA to investigate the murder of a teenage girl found wrapped in plastic. In an entry on March 30, 1968, the fourteen year old Dale writes, "Have just finished reading about Sherlock Holmes in The Hound of the Baskervilles. I believe Mr. Holmes is the smartest detective who has ever lived, and would very much like to live a life like he did. It is the Friends School belief that the best thing one can do in life is to do good rather than do well. I believe that in Mr. Holmes I see a way to accomplish this." On November 20, 1988, Dale, bored with the mundane cases the Bureau has been assigning him, says, "Holmes used cocaine, an alternative I find unacceptable. What I need, what any detective needs, is a good case. Something to test oneself to the absolute limit. To walk to the edge of the fire and risk it all. The razor’s edge. Are there any great cases anymore, Diane? Is there a Lindbergh kidnapping, a Brinks robbery, a John Dillinger, a Professor Moriarty?" The reference to Holmes as "the smartest detective who has ever lived" and the mention of Professor Moriarty alongside two real crimes and a real criminal suggest that Holmes and Moriarty exist in the same universe as the characters of Twin Peaks, which had previously been established as taking place in the CU. The book was written by Scott Frost, whose brother Mark co-created the show, and whose father Warren Frost played Dr. Will Hayward on the show. Mark Frost wrote a pair of novels, The List of Seven and The Six Messiahs, about Arthur Conan Doyle and Jack Sparks, on whom Sherlock Holmes was allegedly based. Clearly the Frost family are very fond of Holmes.